Sitting for extended periods of time without stretching can lead to sciatica pain that can cause a great deal of discomfort if not properly addressed. Symptoms like numbness, tingling and a shooting pain throughout the leg are all common complaints among those that are experiencing sciatica pain. Sciatica is a common occurrence for many and is due to the lower back experiencing excessive compression. Fortunately, there are many exercises that you can do from the comfort of your own home that can aid in combating daily sciatic pain. For additional sciatica pain relief, consult our chiropractor in Loveland. Chironow Loveland is Northern Colorado’s top chiropractic office, offering convenient walk-in services as well as sports physicals and full-body adjustments. With years of expertise in treating those suffering from back, neck and shoulder pain, we have the tools and necessary experience to ensure that you will leave our office feeling better than you did when you stepped through our doors. If you are experiencing symptoms like migraines, hip pain or just feel like your body could use a simple adjustment, don’t hesitate to visit Chironow Loveland. Contact us today. In today’s article, we will be discussing how you can identify sciatica while offering a list of exercises that have proven to effectively reduce the symptoms and pain experienced from sciatica. To learn about a few of the simple stretches that you can do at home for sciatica pain relief, continue reading more below. Sciatica presents itself in many different forms of discomfort but is most easily identifiable by the dull, radiating pain felt in the lower back, just above the buttocks. Aggravated cases of sciatica can lead to numbness or tingling in the legs, or a pain that can be felt traveling down the thigh in short bursts. Since sciatic pain is caused by the lower area of the vertebrae pressing on the sciatic nerve, individuals that sit for long periods of time are generally more prone to experience sciatica at some point in their lives. Let’s take a look at some of the easiest exercises that you can do while at home to relieve any sciatic pain that you may be experiencing. One of the easiest exercises that provides an incredibly deep stretch is a common stretch found in many different styles of yoga. Pigeon pose is one of the best ways to decompress the lower spine while stretching the muscles that can become inflamed from an overactive sciatic. Begin by lying on your back and locating the side of your body that the sciatic pain is stemming from. Next, bring the leg that is experiencing sciatic pain towards your chest by clasping your hands under your thigh while pulling your leg closer towards your body. You may start to feel a stretch in the lower back, just above the buttocks. To achieve a deeper stretch, simply bring your other leg up towards your body and then place your opposing ankle on your knee while pulling your supporting leg closer towards your chest. This will provide an incredibly deep stretch for those that are experiencing a significant amount of tightness in their lower back. If you have limited mobility and are looking for the best stretch to combat sciatica, knees-to-chest is quite possibly the easiest stretch imaginable. Start by lying on your back and then slowly bring your knees towards your chest. Next, interlock your hands around your knees while slowly deepening the stretch by pulling your knees closer to your chest. Many people enjoy rocking back and forth on their back during this stretch, as it can help to massage any tight spots that might not have presented themselves beforehand. You can even massage the muscles located in the lowest area of the back that can easily become sore from an overactive sciatic. Simply rock forwards and backward until you locate the trigger points that are bothering you most. Then, focus your attention on your trigger point by increasing the amount of pressure applied to your lower back while rocking back and forth. You will begin to feel your muscle give way to continuous pressure until it has finally relaxed completely. Another great exercise for relieving back pain and sciatica at home is the sitting spinal twist. 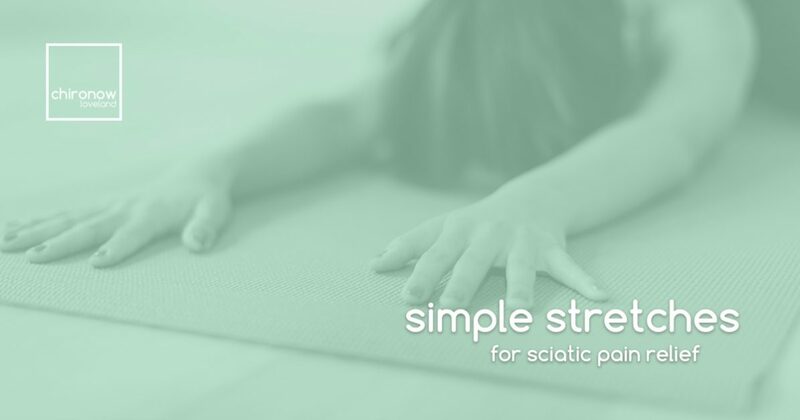 This simple stretch can help elongate and decompress the lower spine, allowing you to take pressure off of your sciatic for immediate relief. To complete a sitting spinal twist, start by sitting upright on the floor with your legs extended outward in front of you. Next, slide your right knee towards your chest and then place your right foot flatly on the floor on the other side of your left leg. Place your left elbow on the right side of your right knee, and then gently twist your body towards the right. You can hold this position to deepen your stretch and can switch sides to target both sides of your lower back. These are three easy stretches that anyone can do at home to help relieve chronic lower back pain that can ultimately lead to sciatica. If you are still experiencing a significant amount of pain after completing these stretches, consider stopping by Chironow Loveland for a walk-in adjustment. We can accommodate patients of all ages and formulate patient-specific treatment plans to help address the pain and discomfort that is affecting you most. To learn more about our full range of services, visit our website or contact us today! We look forward to speaking with you!